Any expert advises hot ukdealers?? any experts here who can share some thoughts on the NVR and DVR options? 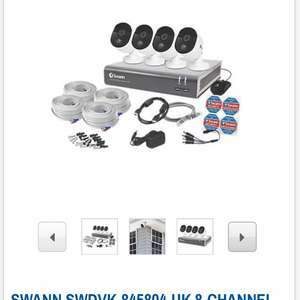 Costco have/had a Swann 4 camera 4MPsystem for £319.99 on their website . One of the things with CCTV is deciding if you want audio as well, its a useful feature to have in my experience . On 90% of the home kits you definitely don't need an electrician, they just plug into the wall normally and as long as the cable is routed safely then it's fine. I'd go with an NVR with POE just because you only have 1 able going to the camera like you say but if thats not a problem then a normal CCTV kit with the sae quality for half the price might be the way to go. POE typically is better for high resolution systems. In terms of wiring the cameras it's almost identical. These sets include the rg59 cable (two wires together). The only difference is when you reach the box POE plugs straight in whilst these go to a mains power source - one plug with a splitter will power multiple cameras! An NVR is used for IP (network) cameras. The cameras process the video as such and then send it down the cable where the video is then stored or viewed through the NVR. Whereas a DVR is used with analogue cameras. The signal is sent down the cable and then the DVR processes the signal. Analogue systems can be susceptible to interference - particularly when over long lengths of cable (300ft +). For home use they're absolutely fine and usually far more affordable. Btw I have a 3mp swann coax system and its great. Sorry but cold from me. They are always available at this price from different retailers. You can get the 3mp system with the newer far more attractive DVR Here for only £9 more with free delivery. Although I would definitely recommend a swann system! Sorry but cold from me. They are always available at this price from …Sorry but cold from me. They are always available at this price from different retailers. You can get the 3mp system with the newer far more attractive DVR Here for only £9 more with free delivery. Although I would definitely recommend a swann system! Just to update. This DVR also has double the storage (2tb). Yeah my bad, I was thinking more along the line of Hikvision systems, where you do need power for the non-PoE cameras. I'm no expert, just been researching over the last couple of months and ended up with a Hikvision NVR and 5mp PoE cameras, still to fit though! I am doing a complete renovation and done CAT 6 cabling . All the wiring has been dragged inside of the walls and is not visible until it pulls out to where the location of the cameras will be ... All i can say is So Help me God ..